Upper Noe Rec Center has a mission to serve as a nexus for our neighborhood to build community. Friends works with Rec & Park to steer programming and functions to bring neighbors together to share experiences, ideas and comradery. To that end, here are some events and activities you won't want to miss. This Wednesday, Upper Noe Neighbors (UNN) invites you to a Post-Election Social. The agenda for this open house is simply Good Food, Good Wine and Good Conversation. UNN debuts the Upper Noe Wine Tasting Club with fine vintages from PumpJack Wine & Spirits. 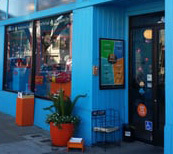 VIP Scrub Club owners Lancy and Sage are newish to the neighborhood -they also own VIP Grooming on 24th Street- and want to share this colorful and joyful space with their new neighbors. This event is free and open to all neighbors. Dogs are welcome, too. Live music by the Promise Kings. Stop in, have a bite and say hello. Come an play for free every Thursday 1 - 3 pm through December. All ages and skill levels are welcome from kids to seniors. 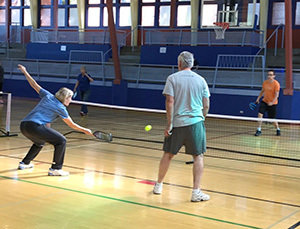 Pickleball is a paddle sport that is quickly growing in popularity. It combines elements of tennis, badminton and ping-pong. It is very easy to learn and has simple rules. The game can be played almost anywhere. Games at Upper Noe will be in the gym with up to four nets to keep everyone in the action. Come on in and join the fun. No registration required. Just show up and get your game on. Volleyball (adults, 18+) 6:30-8:30 p.m Wednesday and Friday. Argentine Tango, advanced (55+) 1 – 4 p.m. Thursday. In September, we held our first-ever outdoor Movie Night on the field and it was a huge success. 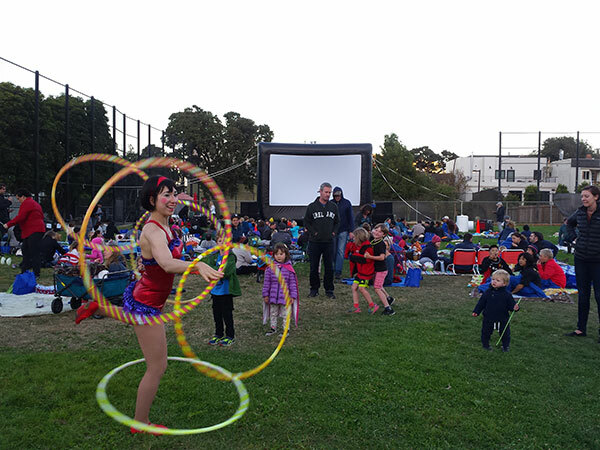 Over 400 kids and parents spread out on the lawn to marvel at circus performers and watch the feature movie Inside Out. Together, we can do more events like this. Please consider lending a hand. Thanks go out to Joan Lionberger for her generous donation of a large shed for Joby’s Run. Volunteers helped relocate and assemble the shed last Saturday. It looks great from inside and outside the park. 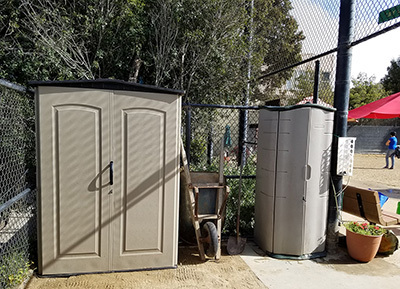 The location in the corner creates a much more attractive space to store the tools necessary for dog run maintenance. Friends of Upper Noe Dog Owners Group provides these for patrons to employ while their pets play. Grab a broom and pitch in. Your five minutes of sweeping or raking can make a big difference.